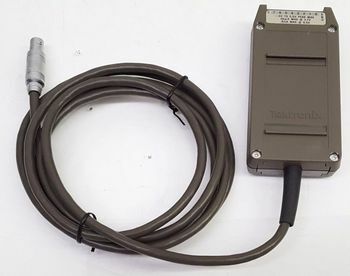 The Tektronix P6407 is a 17-bit Word Recognizer Probe for the 2445 Opt. 09, 2465 Opt. 09, 2430A Opt. 03, 2432A Opt. 03 and 2440 Opt. 03 scopes. It connects to the scope through a 6-pin LEMO S-series connector on the rear panel. The P6407 uses the P64xx-family 10-wire input lead harnesses with 0.2" connectors. Is also possible to use standard jumper wires with pins, sockets or clips on the other end for connecting inputs. −0.5 V to 5.5 V Peak max. The scope sends configuration data (compare and don't care bits) through a shift register made from five 74C164s, similar to the P6406. Signal inputs go to 74F00 gates through 300 Ω resistors, 74F521 comparators test the input bits and a 74F02 drives the cable. This page was last edited on 3 April 2019, at 04:47.